Why do we do this? What are the origins? As with most customs associated with Christmas it is pagan religions that pre-date Christianity that we must turn to. 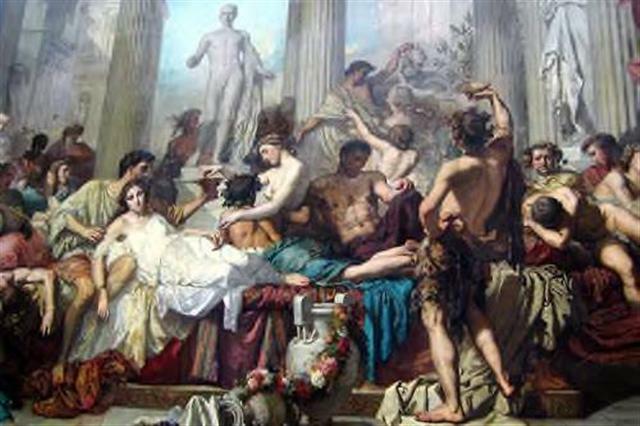 Both Mistletoe as well as Holly and Ivy are linked to the Roman festival of Saturnalia. Saturn was the Roman god of agriculture and fertility. His festival was celebrated around the winter solstice – from about 17th to 25th December. The festival was about bringing back the sun but also praying for fertility in the coming year. It was a time for parties, abandoning social norms and carousing. Slaves were freed from their duties. Because Mistletoe, holly and ivy were used in his ceremonies they also became linked to fertility and were often used in marriages. When the Romans came to Britain they discovered that the Druids revered this plant. The historian, Pliny the Elder referred to their habit of cutting away mistletoe from oak trees using golden sickles and catching it before it touched the ground. The Druids elevated mistletoe to sacred powers. 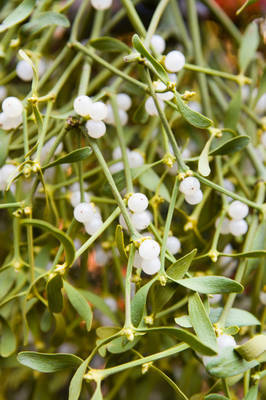 They noted that mistletoe was an evergreen and so it became a symbol of fertility. They believed it could cure certain illnesses, protect cattle and they also hung it over doorways to ward off evil. Now the druids performed the ceremony of collecting the mistletoe around the mid winter solstice and so it was then that it would be put up in houses during this time of year and so again later would become part of Yuletide and eventually Christmastime. 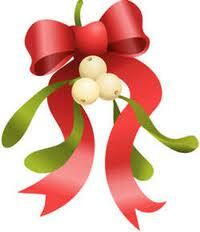 The idea of kissing linked to mistletoe may partially come from anglo-saxon and Norse mythology. 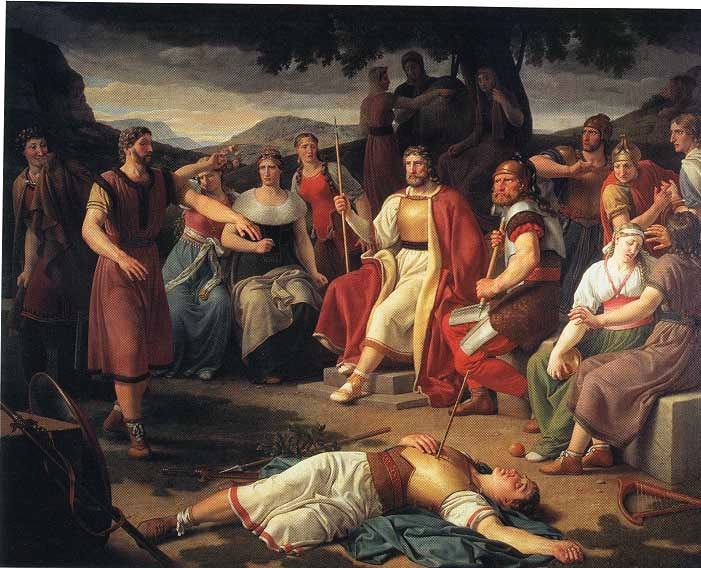 The god Balder was the best loved of all the gods. He had premonitions that he would die. In an attempt to protect him, his mother was Frigga, went through the world, securing promises from everything that sprang from the four elements–fire, water, air, and earth–that they would not harm her beloved Balder. The gods amused themselves by throwing weapons made from all mineral and plants at Balder and laughed when they simply bounced of him. Supposedly the god Loki, who desired to kill Balder, disguised himself and went to see Frigga and asked her if truly nothing could harm her son. . She confided that she had never got a promise from the plant Mistletoe. Loki made an arrow from its wood and arranged that another god throw it at Balder. The arrow pierced Balder’s heart and he fell dead. There is a sad and a happy ending to the tale. In the sad version the gods go to ‘Hel’ to retrieve Balder but fail. In the happy version Frigga works hard to heal her son and he is returned to life. Frigga, over joyed weeps, and her tears became the mistletoe’s white berries. Frigga is so grateful that she made the plant a symbol of love and insists all the gods kiss undneath it. Both the druids and the Norse also saw Mistletoe as a symbol of peace and warring parties would agree to meet under truce where it grew. As Saturnalia was celebrated around the time of year when Christmas would one day be held then use of Ivy and Holly was carried over from one festival to the other. The Christian church needed to put its own spin on the symbolism of Holly and Ivy – hence such uses as the incorporation into a carol. Thus the prickles were equated to the crown of thorns, the berries to the blood of Christ etc. Just as with Holly and Ivy the Church tried at one time to ban Mistletoe but eventually adopted the pragmatic approach of quietly permitting its use. Indeed in some churches it even is incorporated into a service. Yorkminster since ancient times would decorate the high altar with the plant during the winter and use it in a special ceremony of forgiveness. Although they no longer celebrate the service in that fashion a sprig of mistletoe still decorates the high altar during the holiday season as a reminder of ancient customs and the spirit of forgiveness. Christmas is coming in just a few day’s time. Along with the new year celebrations that follow it, it is in Britain the most important festival and holiday of the year. Families get together, give and receive presents, eat and drink and have a good time. Many businesses close down for almost 2 weeks and very little work gets done even in those places that are actually open. Unless of course they are pubs and restaurants! In celebrating this time of year we recreate festivals that predate even the coming of Christianity to Anglo-Saxon England. For here it is deep winter. It is a time of long nights and short days. It is cold and dark and not a time to be out. This is a time to feast and create our own light and warmth and to look forward with hope to the return of the sun. That at least is how our ancestors saw things. Christmas coincides with Yuletide – the ancient celebration that occupied midwinter. Here in England it was celebrated for a number of days running on from the 25th of December. At that time, under the old Julian calendar, December 25 was also the winter solstice. (Today it is 20th December of course). They began the year with December 25, the day we now celebrate as Christmas; and the very night to which we attach special sanctity they designated by the heathen mothers’ night — a name bestowed, I suspect, on account of the ceremonies they performed while watching this night through. The very name for the months that straddled Yuletide -December and January – were considered “Giuli” or Yule by the Anglo-Saxons. The Anglo-Saxons celebrated the beginning of the year on December 25th,which they called Modranect”— that is, Mothers’ Night. This celebration was linked to the rebirth of ‘Mother’ Earth and the whole idea of ceremonies conducted at the time was to ensure fertility in the coming spring season. As the Saxon gods of fertility were Freyja, who governed love and fertility and her twin brother Freyr then they may well have been linked to the celebrations. It is probable that the feasts involved boars. Freyja and Freya were associated with the boar. This was the primary animal represented in Yuletide customs and indeed in Anglo-Saxon culture in general. It is mentioned in epic warrior poetry like Beowulf. A boar’s head may well have been sacrificed to appease the gods and the boar continued to ornament brooches, bowls and jewelry as well as more military objects for centuries. In the year 597 the pope at the time sent Augustine to England to try and convert it to Christianity. The process would take centuries but quite early on it appears that a decision was made to amalgamate the pagan festival of Yuletide with Christianity. Christmas as a festivity celebrating the birth of Jesus originated in Egypt sometime in the second century: here it took over a previous festivity, most likely the birth of Osiris. In Europe, Christianty encountered the Roman cult of Mithras. The 25th of December is now universally accepted as Mithras’ bithday. Mithras was an Iranic deity associated with Sun worship whose cult became so widespread in the Roman Empire as to become a serious threat for Christianity. In 567 AD, in order to encourage the people to abandon pagan holidays, The Council of Tours declared the 12 days of Christmas to be a festival. Historically, the 12 days of Christmas followed-did not precede-December 25th. These dozen days ended the day before Epiphany (the coming of the Magi), which was celebrated on January 6th. 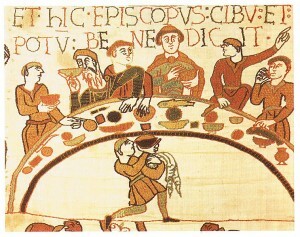 Christian influence, however, remained superficial until the time of the Norman Conquest. 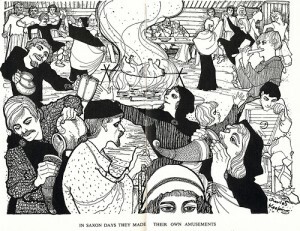 Rites included yule logs, use of evergreens, mistletoe, eating, drinking. Games such as leap frog and blind man’s buff were played at the time and actually originated in ancient fertility customs – an echo of mother’s night. Gradually old Germanic Yule celebrations combined with nativity feasts, and the English Christmas began to take shape. 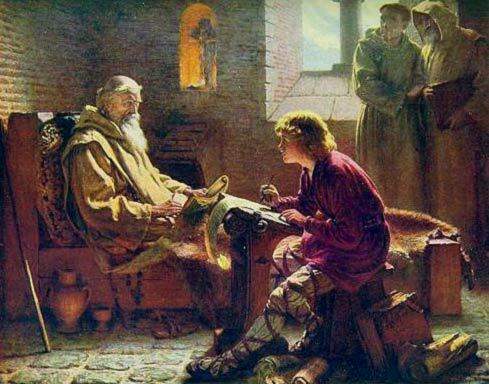 Alfred The Great insisted that no business was done during the Twelve Days. By 1066 the Christianisation of England was complete and the Twelve Days were the main annual holiday. 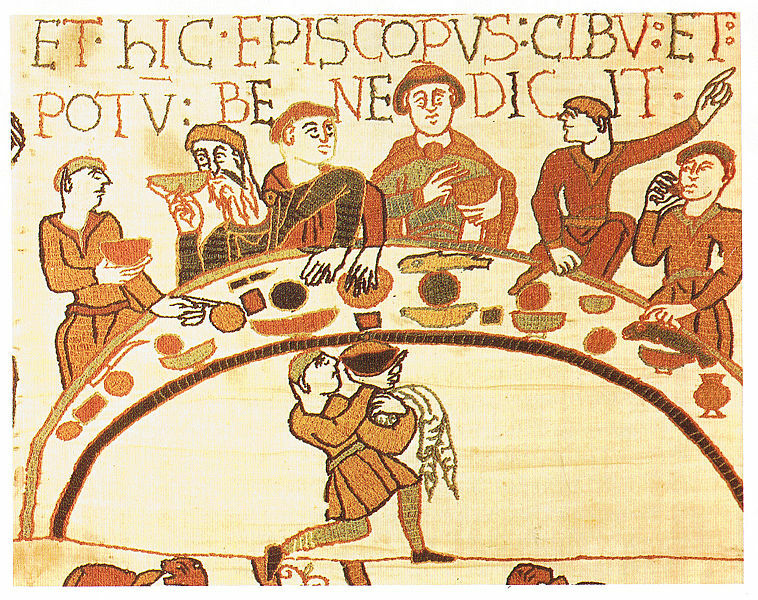 So when we sit down to our Christmas lunch we recreate tradition that stretched back through fifteen and more centuries.